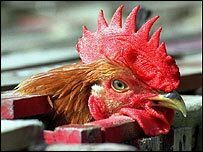 The human death toll from bird flu in Indonesia has risen to 100 - almost half of the total worldwide fatalities. Two Indonesians from the outskirts of Jakarta succumbed to the H5N1 strain of the disease over the weekend, said Joko Suyono of the National Bird Flu Centre. Indonesia is the nation worst affected by bird flu and has struggled to contain the virus. Since the H5N1 virus emerged in South East Asia in late 2003, it has claimed more than 220 lives around the world. Suyono said a nine-year-old boy and a 23-year old woman had died from the disease over the weekend. "The woman died yesterday [Sunday] but we just received the results that she's positive with bird flu," Suyono told AFP news agency. "The total number of deaths is now 100 out of 124 positive cases." Indonesia is one of the only countries to log human deaths year-round. Almost all infected people are thought to have contracted the disease from poultry. But scientists fear the virus could mutate into a form which could be easily passed from human to human, triggering a pandemic and potentially putting millions of lives at risk.